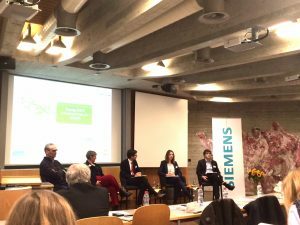 Leading voices from the Swiss energy sector came together on October 21st at the University of St. Gallen for the annual oikos Conference, hosted and organized by oikos St. Gallen. The topic of the one-day event: Energy Storage Solutions for the Future. To the surprise of the audience, which comprised oikos members and alumni, as well as faculty and students from major Swiss universities, the experts quickly agreed that energy storages will not play a major role in Switzerland in the near future: The grid is simply too good. Instead of storing homegrown electricity in local batteries, energy can flow freely to large-scale solutions like pump storage plants. This is made possible by the circular design of the grid, that not only delivers but has the potential to pick up energy at households. Nevertheless, the experts from Siemens, the energy suppliers of Zurich ewz, its equivalent for the region of St. Gallen and SwissPower, an industry association, had great insights into what may be the use of energy storage. While Siemens sees most potential in large scale batteries used by businesses and industry, the local electricity and energy suppliers already experiment with solutions on the household and community level. This contrasting approach to harvesting the new technologies – like sustainable energy sources, batteries have become cheaper and more efficient – was reflected in the case studies presented to the students. Both Siemens and ewz challenged the present students with a case. While the technical expertise among the management students was expectedly narrow, the groups came up with interesting solutions. The conference was concluded by a high-level panel, which included National Council Member and SP floor leader Roger Nordmann, as well as Sonja Lüthi, local politician for the Green Party and energy expert, Gianni Operto, industry old hand and president of an association promoting renewables and energy efficiency, and Doris Schmack, a longstanding researcher and currently head of the MicrobEnergy project.